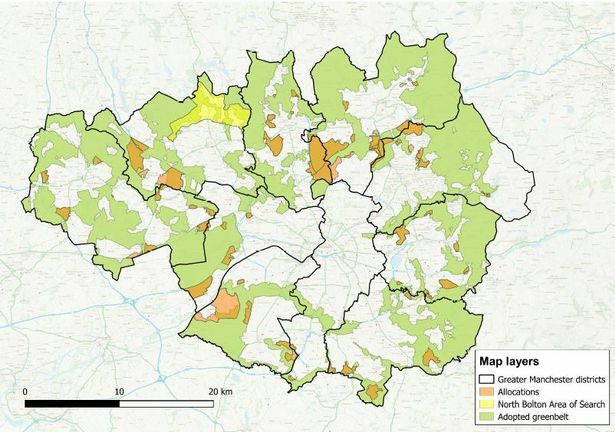 Proposals have been published by Greater Manchester Councils for massive plans to build on green belt land in Bury. – the release of 255 hectares of green-belt land south of the M62 around Simister extending westwards towards Prestwich for 2,300 homes. – the release of 62 hectares of green belt land around Pole Lane and Mode Hill Lane in Whitefield for 600 homes. – the release of 500 hectares of green belt land to the east of the M60 as part of a massive industrial/employment site known as the ‘Northern Gateway’ (bigger in size that Trafford Park). – 87 hectares on land around Elton Reservoir and to the east of Starling Road where there will be potential for 3,500 homes. – land north and south of Walshaw Road where there will be space for 1,250 homes. – Holcombe Brook will receive 100 new homes on 3.12 hectares to the south of the existing urban area in the village. – 4.3 hectares by the existing residential development in the Seedfield area of Bury Sixty homes on a 1.7 hectare site to the south of Bentley Lane in Bevis Lane. Greater Manchester Council Leaders, including the Leader of Bury Council, will ‘sign off’ the proposals for consultation at their meeting on 28 October 2016. The proposals will then be subject to public consultation. 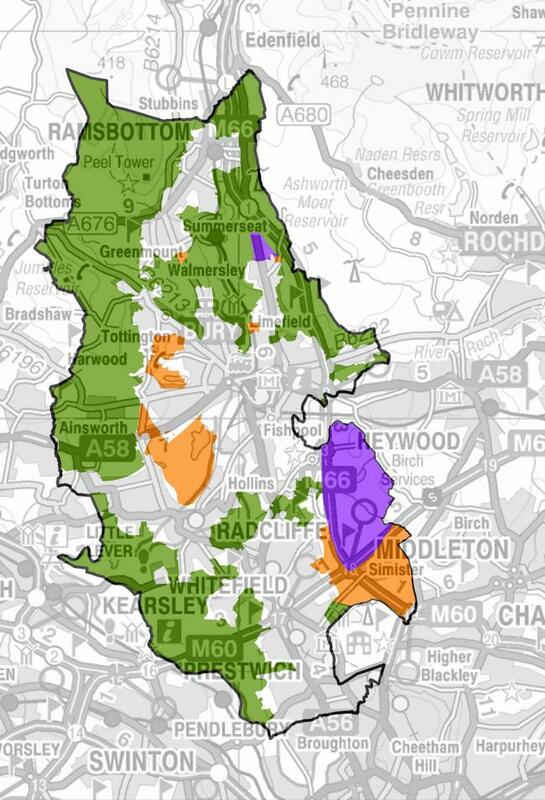 The largest share of the destruction of the Green Belt is in Bury. The Pillsworth industrial/employment site will be bigger in area than Trafford Park. The whole area around the M66 from Simister and Bowlee northwards towards Heywood will bigger than the existing built up areas of Prestwich and Whitefield combined. It is a disgrace that they have let down the people of Bury in this way. The proposals open massive questions about the capacity of local services. Not only do we lose our countryside, but what roads will 25,000 extra people drive down? What trams will 25,000 extra people get on in the mornings? What schools will 20,000 extra children go to? What health services will they use? The northern part of the M60 is already one of the most congested motorways in Europe, how will this cope with all this new industry and houses? We support the need for extra housing, but Greater Manchester has one of the largest supplies of existing ‘brownfield sites’ anywhere in the region. Destruction of our countryside on this massive scale is just not necessary. These proposals must be stopped. Please sign our petition to send the very clear message to Bury Council that they cannot destroy our countryside.